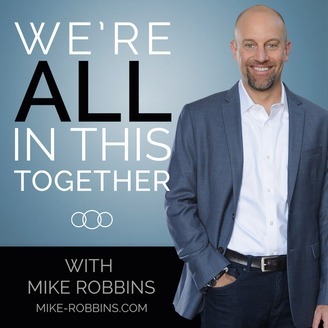 On We're All In This Together, leadership and team performance expert Mike Robbins interviews interesting and influential business leaders, thought leaders, and change makers. Over the past 18 years, he has partnered with people, leaders, and teams within top organizations like Google, Wells Fargo, Airbnb, Gap, Microsoft, Schwab, the NBA, Genentech, eBay, the Houston Astros, and many others. 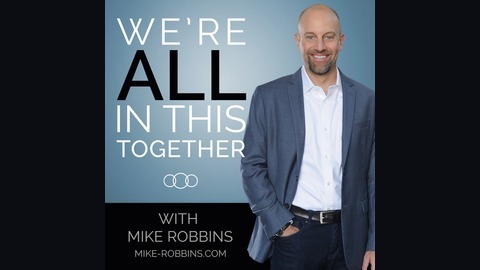 Mike gets real with his guests, so that you can learn the truth behind their stories, how they've overcome challenges, and specifics tips about leadership, teamwork, and life. These conversations are designed to give you practical ideas, insights, and techniques to enhance your success, impact, and the performance of your team. For more information on Mike Robbins and his work, visit www.Mike-Robbins.com. Ashley Goodall, SVP of Leadership and Team Intelligence at Cisco, invites us to think freely about work and life. In this thought-provoking conversation, he discusses how we can challenge today’s conventional wisdom about leadership and focus on what research and experience prove to be effective. He also talks about his partnership with Marcus Buckingham in writing their new book, Nine Lies About Work: A Freethinking Leader’s Guide to the Real World, and what truly matters when it comes to inspiring excellence in ourselves and others. [4:50] Ashley describes the writing process for his book Nine Lies About Work, which he co-authored with Marcus Buckingham. He would make time for writing on weekends, early mornings and would re-write and go over drafts while traveling for work. Even just setting aside 2-3 hours a week for writing can make a huge difference. [7:50] Great leaders stay curious about what really works, and how to measure if something is working. [8:49] Ashley appreciates the perspective that working at large companies gives him, and how they are living examples of creating significant transformation in an environment that intertwines others. [11:16] Ashley and Marcus wrote Nine Lies About Work to share wisdom from both evidence-based research and on the ground experience. [18:19] We should focus not only how to give feedback, but how it will help others grow. [20:43] Excellence is idiosyncratic. We are unreliable raters of other human beings, and since the information of feedback can be highly suspect, the best way to give it and receive it is to understand it comes from the individual’s truth and perspective. The true understanding comes from our own “aha” moment instead of from others telling us what to do. [28:08] The phrase “Good Job” is the beginning of the conversation, not the end. It gives us a chance to talk about what went right, how to do it again, and possibly how to do it even better. [35:28] The most important job as a leader is to build and encourage excellence in others. They see themselves in one way or another in their leader. The leader provides them assurance about the future. The leader displays confidence and has seen around the corner.